Single serve sachets. Organic.Love matcha latte? Love turmeric latte? Why not have both. We have blended them for you to make a super healthy latte. Matcha is a superhero amongst teas. 100% ground green tea leaves from Nishio, Japan - essentially a super-concentrated green tea containing natural green tea flavonoids (catechins). Matcha tea bushes are grown under shade to increase their chlorophyll content and then ground by granite stones into a super fine powder. So when you drink matcha, you're ingesting every little bit of lovely green tea good stuff. That's why we call it super power green tea. 100% pure organic matcha, organic turmeric, organic liquorice. Nothing added. Contains ECGC, L-Theanine (catechins or flavonoids) and beta carotene. Our matcha is premium grade (that means it's top notch). Full 1g matcha serving in every sachet (daily dose!). 7 calories* per sachet * If drunk with milk calories per cup will be higher. 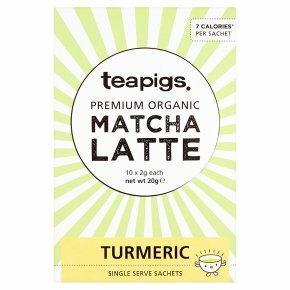 200ml of skimmed milk + matcha = 78 calories. Make a matcha latte: Whisk vigorously into a small amount of hot milk. Top with hot frothy milk . Great with either dairy or non-dairy milks - your choice! No sugar, No milkpowder How does it taste? Sweet, spicy and matcha.